Among the lesser-known groups of cyprinodontid fishes is one with several European members adapted to exist in some surprising environments. The genus Aphanius Nardo 1827 currently contains in excess of 20 species/subspecies distributed throughout coastal environments of the Mediterranean region, Red Sea, Gulf of Aden and Persian Gulf plus portions of the Arabian Sea as far west as the border between Pakistan and north western India. Inland distribution is mostly restricted to Turkey and Iran although some land-locked populations exist in northern Africa and the Jordan Rift Valley. Fossil remains have been found as far north as Germany. The history behind this rather disparate distribution is interesting as it's believed that the ancestral Aphanius species inhabited coastal zones of the former Tethys Sea. This was a shallow inland sea that separated the ancient continents of Laurasia (in the north) from Gondwanaland (in the south) during the Mesozoic era (251 -- 65.5 mya) but which later split into the Mediterranean, Black, Caspian and Aral seas. The final closing of the Tethys around 20 mya resulted in the splitting of the ancestral Aphanius into eastern and western groups which today have evolved to form two 'clades' (groups of closely-related species). The eastern clade comprises those species distributed to the south and east of the Anatolia plateau in Turkey, with the exception of some Iranian species, while the western clade contains those found in Anatolia and around the majority of the Mediterranean coastline. All are restricted to coastal/estuarine zones, land-locked oases or isolated intermontane basins where in several cases they're the only surviving fish species. In many ways Aphanius spp. can therefore be regarded as a relict group of fishes and unfortunately this is reflected in their conservation status with most under threat of extinction. Human influences such as water extraction for agriculture or tourism, dessication of water bodies for building work, introduction of exotic fishes such as Gambusia spp. and pollution are largely to blame for their decline. Despite the appearance of ten species on the IUCN Red List this fact is largely unrecognised both officially and in the aquarium hobby with formal habitat preservation efforts existing only in a handful of cases. A couple of critically-underfunded, smaller scale projects are also working to maintain long-term captive populations of other species though to what end remains to be seen. The best-known case is that of A. sirhani Villwock, Scholl and Krupp 1983 which is endemic to the Azraq oasis/wetland in the eastern desert of Jordan. Azraq is the only permanent, natural wetland in the country and originally comprised an extensive area of spring-fed marshland which formed an important annual stop-off point for millions of migratory birds. 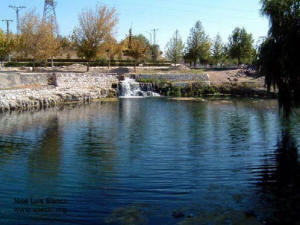 Despite being recognised as a significant site by RAMSAR as long ago as 1977 and established as a reserve in 1978 water pumping for urban use plus the excavation of artesian wells for agriculture resulted in the total dessication of the aquifiers feeding the oasis by 1992 with the water level reduced to 12 metres below ground level. Remarkably A. sirhani survived and following habitat restoration efforts in the mid-1990s (when it was considered extinct for a period) around forty-five wild adult specimens were counted in a 2000 census. The current situation is unclear with some sources, including the IUCN, suggesting it may already be extinct in the wild. Although Azraq has now been restored to around 10% of its original size illegal water extraction is rife and the introduction of an exotic tilapia Sarotherodon galilaeus (Linnaeus 1758) has inevitably contributed to its decline. Several captive-breeding efforts continue and the species remains Jordan's only endemic vertebrate. Though the majority of Aphanius species are in the hobby they're rarely traded on a commercial basis and maintained mostly by enthusiasts and zoos. However in the last couple of years A. mento (Heckel, 1943) has become available on the market and it appears at least one farm in Singapore is breeding it in significant numbers. This is one of the more attractive members of the genus when spawning with males taking on a near jet-black body and fin colouration peppered with iridescent blue markings. In nature it's one of the more widely-distributed Aphanius species inhabiting coastal regions of Mediterranean Turkey, Syria, Lebanon and Israel. In Turkey it ranges eastwards from Antalya through the provinces of Mersin, Adana and Hatay and is known from a number of inland localities within the Ceyhan and Seyhan river systems in the southeast of the country. Various land-locked populations also exist, some of which have been introduced by humans e.g. that found in a man-made pond near the settlement of Bor. Further north and east it's been recorded throughout the great Tigris-Euphrates basin in eastern Turkey, Iraq and Syria as far as the confluence of the two rivers, where they become the Shatt-al-Arab, close to the border with southwestern Iran. In Syria it's known from the Orontes river valley and occurs along the coastline into Lebanon and Israel while inland it's found in some springs of the Jordan Rift Valley, north of the Dead Sea. Colouration and patterning vary considerably depending on origin and it's therefore important not to mix the different forms as they hybridise freely. For this reason it's common practice to label the fish with the collection locality if known, though these are frequently misspelled. Some of those being bred in Europe at the moment include variants from Bor, Elbistan and KirkgÃ¶z (all in Turkey). These tend to differ in base body colouration plus intensity and distribution of the blue markings, the latter distributed in irregular vertical bars in some forms. Unfortunately the origin of the commercially-bred fish is unclear and thus they should never be mixed with specimens known to be derived from wild stock. Habitats tend to contain relatively still water though it's been recorded in a swiftly-flowing small river on at least one occasion. It's most commonly observed in marginal zones where aquatic plants and/or filamentous algae proliferate and is known from both fresh and slightly brackish water environments. At KirkgÃ¶z , a karstic spring in Antalya province, southern Turkey conditions are salty with relatively high volumes of chlorine, magnesium and calcium. pH has been measured over the range 6.88-7.58 and the water is crystal clear with dense patches of submerged vegetation and algae. The form from KirkgÃ¶z is also among the most beautiful, with males exhibiting particularly intense colouration from a young age, and the one I've been maintaining for the last couple of years. Captive maintenance is often said to be difficult due to the combative behaviour displayed by males and this species is indeed among the more aggressive in the genus. Attempts to keep sexed pairs or groups in small tanks invariably result in the death of the female or subdominant specimens. Similarly it will not do well in a community, often attacking fishes much bigger than itself and should be kept in a species-specific arrangement in all but the most exceptional circumstances. Both sexes reach 60 -- 65 mm SL which is relatively large for the genus although some populations are known to grow even bigger. 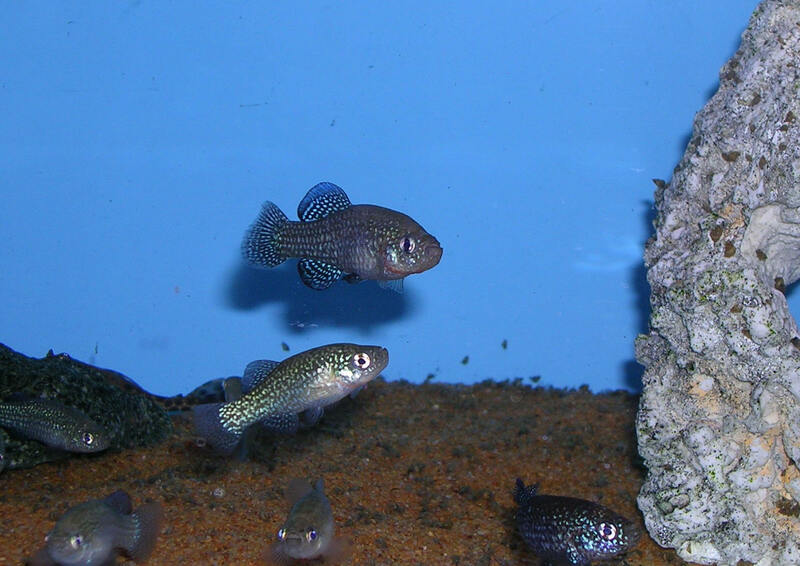 A tank or container with a minimum surface area of 75 cm x 30 cm is therefore recommended and this should be literally stuffed with woollen spawning mops and/or fine-leaved plants to allow the fish respite from one another and provide a suitable spawning medium. 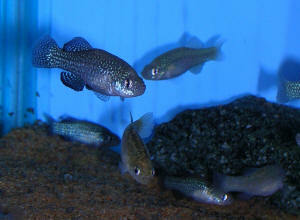 Use of a substrate is optional but standard aquarium gravel or sand can be added if you prefer. Filtration need not be too strong and an air-powered sponge-type filter set to turn over gently is arguably the best choice since loose eggs can be sucked into mechanical units. Lighting should be relatively strong to encourage the growth of algae which provides not only a natural spawning medium but additional food source for both adults and fry. Ideally situate the tank in such a way that it receives sunlight for as much of the day as possible. I use a plastic container matching the above dimensions and containing 8 adult fish which works well since no single specimen can be targeted excessively. A higher ratio of females to males is recommended but not essential provided the amount of cover is sufficient. Like other Aphanius species from the northern Mediterranean region A. mento is active over a wide temperature range of ~35 -86Â°F/2 -- 30Â°C and is even known to survive under ice for brief periods. In captivity it certainly fares best when offered a cooler period during winter months since if constantly maintained under warm conditions noticeable reductions in both lifespan and fecundity become apparent. It also seems to benefit from a diurnal rhythm of warmer days and cooler nights and can actually be kept outdoors year round in many parts of the world, though please note this is illegal in the UK and some other countries. Hard, alkaline water is mandatory; aim for a pH between 7.5 - 9.0 and general hardness value of 10 -- 30Â°. Some populations, including the 'KirkgÃ¶z' form, also require a little marine salt in their water though this shouldn't be a problem with the commercially-bred fish. Feeding is easy with small live/frozen foods such as Artemia, Daphnia and bloodworm accepted as well as most good-quality packaged foods. Algae and plant matter forms a surprisingly significant proportion of the natural diet so if the former is unavailable use a dried product with added vegetable content. Feedings of higher-protein foods should be increased during the spawning season when the species displays a high reproductive effort. This species is easily sexed with males by far the more colourful even when not in spawning dress. Females are larger and plainer, lacking iridescent markings on the body and fins. Breeding is also a relatively simple affair with the natural spawning period occurring between April and September with peaks during early and late summer. It's a fractional spawner meaning females deposit a few eggs on a more-or-less daily basis. Courting males intensify in colour to spectacular effect and form temporary territories which are vigorously defended against rival males and from where they display to ripe females in the vicinity. Eggs are released singly or in small batches and attached to the chosen medium by means of tiny, adhesive filaments. Like all members of the genus A. mento is an avid predator of both eggs and fry therefore in smaller set-ups the most productive method is to move the eggs for hatching/rearing. Use a small set of forceps to transfer one by one to a separate tank or container taking care not to damage them, or simply remove the medium itself. In larger tanks/outdoor pools some fry may survive to adulthood though usually only in small numbers. The incubation period varies with temperature but is normally 6 -- 14 days with the young fish able to accept Artemia nauplii, microworm and similar foods as soon as they are seen free-swimming. If conditions are satisfactory they grow quickly and begin to accept powdered dry foods just a couple of weeks post hatching. Small daily water changes of around 10% tank volume are also recommended to ensure optimal growth rate. To conclude it must be said that all Aphanius species are best suited to the specialist breeder prepared to maintain and breed them over the long-term, particularly given the precarious conservation status of most species. However for those wishing to attempt something a little different the farmed fish currently flooding the market certainly represent a challenge provided they're not allowed to hybridise with wild populations. I am the president of the 'Belgische Killifish Vereniging' and editor of the magazine 'Killi Kontakt'. I would like to get in touch with Matt Ford regarding Aphanius. Would it be possible to let me have his e-mail address or else could you forward this message to him please.